This blog originally appeared on the Mental Elf site on 26th August 2015. The efficacy of different smoking cessation interventions is always a hot topic around our woodland campfire. We’ve blogged previously about the effectiveness of both pharmacological and psychological treatments for smoking cessation, as well as their effectiveness among different populations of smokers. 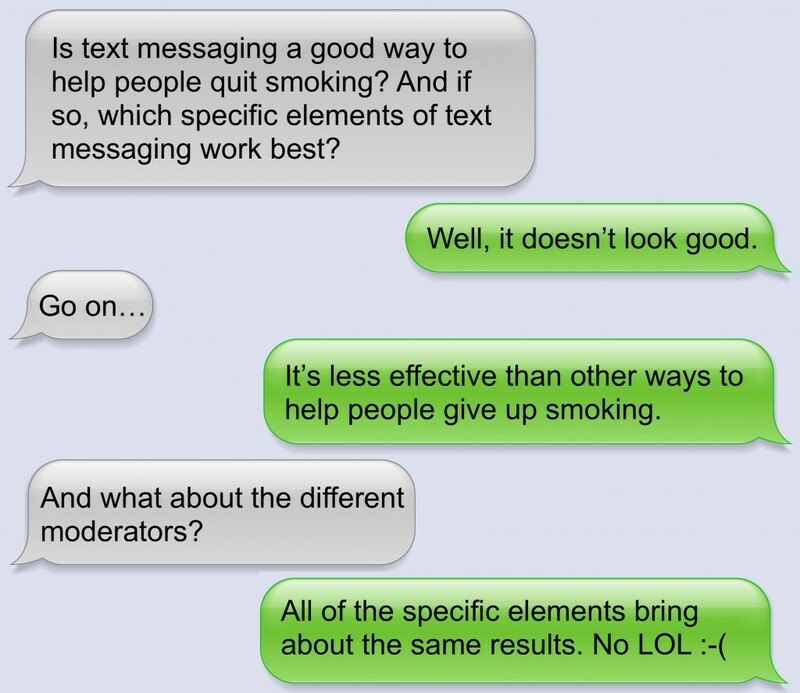 A recent systematic review and meta-analysis investigated the efficacy of SMS text message interventions for smoking cessation. Unlike the majority of other smoking cessation interventions, using mobile phones to deliver health information allows for direct interaction between clients and practitioners without face-to-face interaction and permits the collection of large amounts of data. It is therefore cost-effective and easily scalable to large populations. 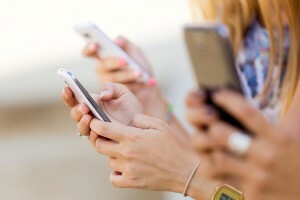 Previous meta-analyses have looked at the effectiveness of text messaging interventions for smoking cessation, but the review recently published by Spohr and colleagues is the first to investigate which elements or moderators of text message interventions are the most effective in supporting smoking cessation. The authors searched for randomised controlled trials which investigated the efficacy of text messaging interventions for smoking cessation. Only studies which included a follow-up measure of smoking abstinence were included. 13 articles met all of these inclusion criteria. ‘SMS plus’ (where SMS support is combined with either face-to-face or web-based support). Dynamic schedule (depends on the stage of cessation the client is at). Dynamic message track (user quit status and stage of change can influence intervention messages). Targeted messages (customised messages to a population subgroup). On-demand messaging (allow users to text a keyword in emergency situations to receive additional support. Some interventions allow users to connect with other users for support and encouragement). Bidirectional messaging (to obtain data from the client). User-initiated (containing requests for additional support). Intervention success was assessed using seven-day point prevalence as the primary outcome measure, as 11/13 of the studies reported these results. Two other studies only reported 6 month continuous abstinence. The researchers used an intention to treat analysis. The 13 articles resulted in a cumulative sample size of n = 13,626. Participants were primarily adult smokers (six studies), but four studies recruited participants aged 15 or over and three targeted adolescents and young adults (ages 16-25). Smoking quit rates for the text messaging intervention groups were 35% higher as compared to control groups (OR = 1.35, 95% CI = 1.23 to 1.49). There were no differences (QB = 0.56, df = 1, p = 0.46) in intervention efficacy between those which provided text-only support (k = 6) as compared with text messaging plus additional support (k = 7). However, text-only interventions had a slightly larger effect size than those with text messaging plus additional support. There were no differences (QB = 0.89, df = 1, p = 0.35) in intervention efficacy between those which promoted the use of nicotine replacement therapy (NRT) (k = 7) as compared with those which did not (k = 6). There were no differences (QB = 0.96, df = 2, p = 0.62) in intervention efficacy between those which provided decreasing schedule (k = 8) as compared with fixed schedule (k = 3) or variable schedule (k = 2) support. However, those which had a fixed schedule had larger effect sizes than either of the other types of schedules. There were no differences (QB = 0.38, df = 1, p = 0.54) in intervention efficacy between those which used a fixed message track (k = 5) as compared with a dynamic message track (k = 8). There were no differences (QB = 1.54, df = 2 p = 0.46) in intervention efficacy between those which used message tailoring (k = 8) as compared message targeting (k = 1) or a combination of both (k = 4). All studies included some form of message content tailoring. There were no differences (QB = 0.15, df = 1, p = 0.70) in intervention efficacy between those which used on-demand messaging (k = 11) as compared with those which did not (k = 2). There were no differences (QB = 0.02, df = 1, p = 0.88) in intervention efficacy between those which provided peer-to-peer support (k = 5) as compared with those which did not (k = 8). All of the studies used bidirectional messaging so the effectiveness of this moderator to unidirectional messaging could not be assessed. There were no differences (QB = 0.17, df = 1, p = 0.68) in intervention efficacy between those which included assessment messages (k = 7) as compared with those which did not (k = 6). 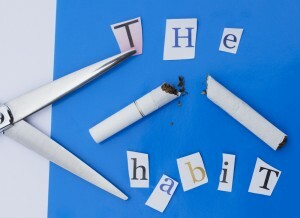 This meta-analysis found that smoking cessation interventions which used text-messaging increased the odds of successfully quitting smoking by 35%. To put this in perspective, other reviews have found that telephone quit lines increase smoking cessation success by 60%, social support increases success by 30% and practical counselling by 50%. NRT and other medications have been shown to increase cessation success by between 50% and 310% (Fiore et al., 2000). None of the moderators investigated here were found to be more effective than any other. There was some evidence that interventions which used fixed schedules were more effective than those which used either decreasing or variable schedules. Similarly, there was some evidence that text-only support programs were more effective than those which provided a ‘text-plus’ service. However, there was no robust statistical evidence for these differences. Overall, these results provide no evidence that text-messaging interventions, which are more complex and time-demanding (i.e. text-plus, on-demand messaging, variable schedules, social support communication), are any more effective than the simplest interventions. However, given the cost-effectiveness, relative ease of delivery and promise of efficacy of these interventions, future research should continue to determine what moderators make an effective text-based intervention. The authors relied on data obtained from the original articles to compile this meta-analysis, rather than contacting the researchers themselves. As data regarding the actual use by users of some of the moderators such as social support and on-demand messaging was not reported in articles, we cannot be certain whether the failure of these moderators to increase quit success is because they are simply not more effective, or because users didn’t actually use these services. The number of studies included in this meta-analysis was small (only 13 studies). This is even more the case for the moderator analyses. Drawing firm conclusions from the statistical evidence is therefore difficult. Fiore MC, Bailey WC, Cohen SJ, Dorfman SF, Goldstein MG, Gritz ER, … Lando HA. (2000) Treating tobacco use and dependence: a clinical practice guideline: Publications Clearinghouse. This blog originally appeared on the Mental Elf site on 30th July 2015. 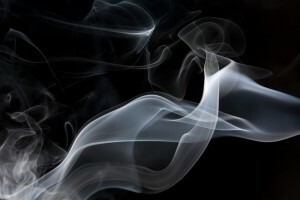 Hot on the heels of a recent study suggesting a dose-response relationship between tobacco smoking and subsequent risk of psychosis, a systematic review and meta-analysis (including the data from that prospective study) has now been published, again suggesting that we should be considering the possibility that smoking is a causal risk factor for schizophrenia. As I outlined in my earlier post, smoking and psychotic illness (e.g., schizophrenia) are highly comorbid, and smoking accounts for much of the reduced life expectancy of people with a diagnosis of schizophrenia. For the most part, it has been assumed that smoking is a form of self-medication, to either alleviate symptoms or help with the side effects of antipsychotic medication. The authors followed MOOSE and PRISMA guidelines for the conduct and reporting of systematic reviews and meta-analyses, and searched Embase, Medline and PsycINFO for relevant studies. They included studies that used ICD or DSM criteria for psychotic disorders (including schizophrenia, schizophreniform disorder, schizoaffective disorder, delusional disorder, non-affective psychotic disorder, atypical psychosis, psychotic depression, and bipolar mania with psychotic features). To test the first hypothesis, studies with a control group were used to calculate an odds ratio. To test the second, prospective studies in which rates of smoking were reported for patients who developed psychotic disorders compared to controls were included, so risk ratios could be calculated. To test the third and fourth, prospective and case-control studies were included, and for the onset of psychosis, cross-sectional studies were also included. Effect size estimates (weighted mean difference for continuous data, and odds ratios for cross-sectional data or relative risks for prospective data) were combined in a random-effects meta-analysis. A total of 61 studies comprising 72 independent samples were analysed. The overall sample included 14,555 tobacco users and 273,162 non-users. The overall prevalence of smoking in people presenting with their first episode of psychosis was higher than controls (12 case-control samples, odds ratio 3.22, 95% CI 1.63 to 6.33, P = 0.001). This supports hypothesis 1. Compared with non-smokers, the incidence of new psychotic disorders was higher overall (6 longitudinal prospective samples, risk ratio 2.18, 95% CI 1.23 to 3.85, P = 0.007). This supports hypothesis 2. Daily smokers developed psychotic illness at an earlier age compared with non-smokers (26 samples, weighted mean difference -1.04 years, 95% CI -1.82 to -0.26, P = 0.009). This supports hypothesis 3. Age at initiation of smoking cigarettes did not differ between patients with psychosis and controls (15 samples, weighted mean difference -0.44 years, 95% CI 1-.21 to 0.34, P = 0.270). This does not support hypothesis 4. 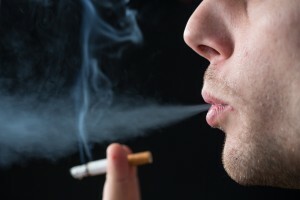 The authors conclude that the results of their systematic review and meta-analysis show that daily tobacco use is associated with an increased risk of psychotic disorder and an earlier age at onset of psychotic illness, although the magnitude of the association is relatively small. Interestingly, the authors interpret their results in the context of the Bradford Hill criteria for inferring causality (which consider the strength, consistency, specificity, temporality, biological gradient, plausibility, coherence, experiment, and analogy of an association). They argue that, where these criteria can be applied (the specificity criterion cannot be applied because smoking affects so many disease processes, while the experiment criterion is not met because animal models of psychotic illness that capture important features such as delusions are impossible), they do appear to be met by the evidence available. The first is that all analyses relied on observational data, which makes strong causal inference impossible. Longitudinal prospective studies help somewhat in this respect, but only a small number were available for inclusion in the analysis of risk of developing psychosis between smokers and non-smokers. Moreover, even these studies cannot exclude the possibility that symptoms present before a first full episode of psychosis may have led to smoking initiation (i.e., self medication). Another important limitation is that very few studies measured or adjusted for use of other substances (most importantly, perhaps, cannabis, which has been widely discussed as a potential risk factor for schizophrenia). This is a potentially very important source of bias. Nevertheless, this is a well-conducted systematic review and meta-analysis that brings together a reasonably large literature. The results appear robust, although given the observational nature of the data, and the fact that only data that were comparable across studies could be meta-analysed, any conclusions regarding causality need to be very tentative. It seems that we should seriously consider the possibility that smoking is a causal risk factor for schizophrenia. Of course, the data available to date aren’t definitive, and we need to be very cautious about inferring causality from observational data, but this does feel like an area where there is growing, converging evidence from multiple studies using multiple methods. It’s also worth bearing in mind that even if smoking is a causal risk factor, this does not preclude the possibility that smoking is also used as a form of self-medication. There are several thousand constituents of tobacco smoke; it is possible that some of these alleviate symptoms, while others exacerbate them. For this reason, we shouldn’t assume that nicotine is necessarily the culprit if smoking is indeed a causal risk factor; it may be (and Gurillo and colleagues discuss the biological plausibility of nicotine in this context), but that will need to be tested. This last point is particularly important in the content of ongoing debate regarding the potential harms and benefits of electronic cigarettes. If smoking does turn out to be a causal risk factor for schizophrenia, then whether nicotine or something else in tobacco smoke is identified as the culprit will have an important bearing on this debate, and attitudes towards these products. Munafo M. Smoking and risk of schizophrenia: new study finds a dose-response relationship. The Mental Elf, 1 Jul 2015. Posted in Comment, Mental elfTagged meta analysis, Psychosis, schizophrenia, Smoking, tobaccoLeave a Comment on Does tobacco cause psychosis?